To maintain a competitive edge in the meat industry, we are continuously looking for passionate individuals who aspire to make a positive impact in what they do. 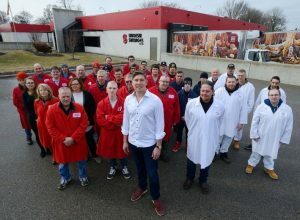 Here at Sikorski Sausages, we value all individuals who share our desire regardless of their personal level of ability and are prepared to accommodate any prospective employees who are differently abled. If you might require any special physical or training considerations from us to aid in your employment, please be sure to notify us in advance and we will do our best to provide whatever is required. Exp in prep of traditional European smoked meats, operate natural wood burning smokehouses. Handle raw meat, sausage formulation, trim meat, mix, stuff, hang sausages. Do cooking & cooling procedures.